Volkswagen Commercial says it will help make the MoT less testing with its insurance offer. Most van operators will appreciate that the MoT test for their vehicles can be a testing time but a new offer from Volkswagen Commercial may change this. 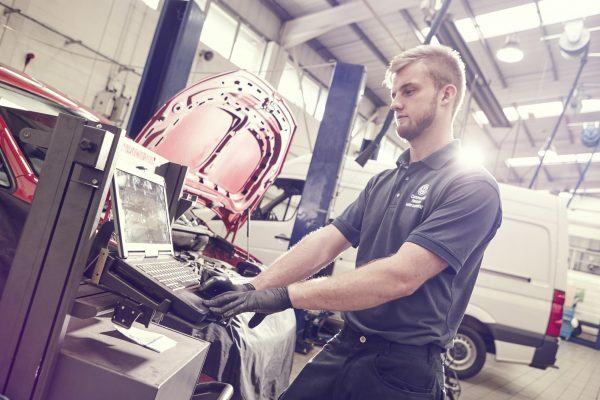 VW says it appreciates that the MoT test can be not only stressful but also potentially costly for operators and drivers being left with a large bill. There’s also the worry that the van will spend a long time off the road awaiting repair. Now, Volkswagen Commercial vehicles has unveiled a new MOT insurance scheme which is aimed at giving owners and drivers peace of mind. This is helpful since the Driver and Vehicle Standards Agency highlights that one in six vans will fail their MoT at first test. The new insurance offering from VW will see a van being covered for up to £750 of repairs though this will be offered free to customers with a qualifying vehicle. The insurance will be offered to customers for their next test when they have an MoT test completed in one of the firm’s own Van Centres. The vans must be under 10 years old with less than 150,000 recorded miles. Also, Volkswagen says that the standard wear and tear items such as tyres, bulbs, fuses and brakes as well as the glass and bodywork will be excluded. However the key components that could leave the owner with a big repair bill will be covered. The insurance policy has a £10 excess fee for any claim and the work will be carried out by qualified VW experts using genuine VW parts. In addition, VW has also announced it is extending the warranty for it Crafter vans. The new offering will see the warranty being extended to three years and unlimited mileage. They say this is the best in class offering and applies to all new VW Crafter models. Previously, there was a 60,000 miles limit on the warranty but growing numbers of operators have vehicles that exceed 60,000 miles regularly. The warranty will protect against the failure of most electrical and mechanical components due to manufacturing defects. There are also a number of offers available at all Volkswagen Van Centres to make the Crafter more affordable than it’s ever been before and there are finance plans available to help with budgeting.